Obama: Katrina A 'Man-Made' Disaster Caused By Government Failure : The Two-Way The president said that what started out as a natural disaster became something much worse when government didn't "look out for its own citizens." 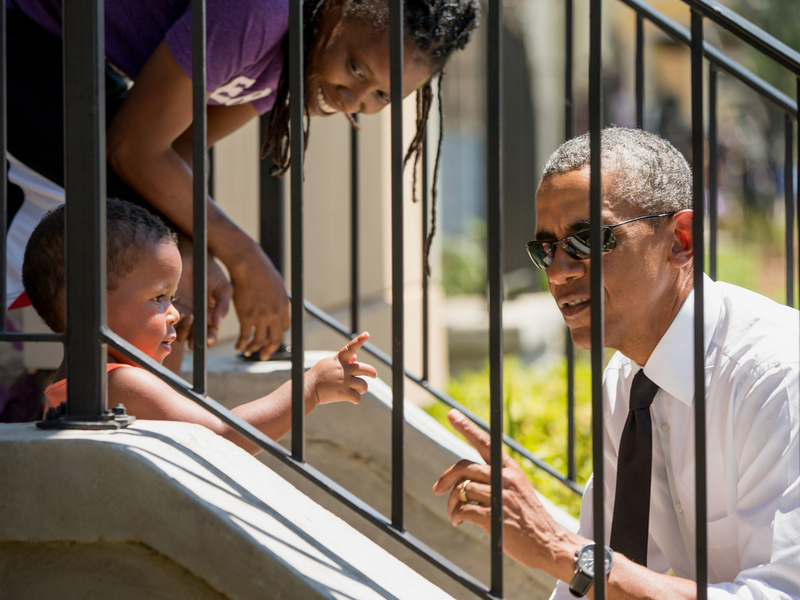 President Obama greets residents in New Orleans on Thursday while in town to mark 10 years since Hurricane Katrina. A decade after Hurricane Katrina — the costliest natural disaster in U.S. history — President Obama told a crowd in New Orleans that the storm was a "man-made" calamity that had as much to do with economic inequality and the failure of government as it did the forces of nature. "What started out as a natural disaster became a man-made disaster — a failure of government to look out for its own citizens," the president said in a speech at a newly opened community center in the Lower Ninth Ward, a predominantly black neighborhood that was devastated by Katrina. Obama was a freshman U.S. senator from Illinois when Katrina struck New Orleans on Aug. 29, 2005. The storm smashed the Gulf Coast from Texas to central Florida, causing power outages and a massive storm surge that topped the levees in the city, causing massive flooding. Nearly 2,000 people died, most in New Orleans, and another 1 million were displaced. Local and federal agencies were at a loss to respond effectively. "New Orleans had long been plagued by structural inequality that left too many people, especially poor people, especially people of color, without good jobs or affordable health care or decent housing," Obama said. "Too many kids grew up surrounded by violent crime, cycling through substandard schools where few had a shot to break out of poverty," he said. "Not long ago, our gathering here in the Lower Ninth might have seemed unlikely," Obama said. "Today, this new community center stands as a symbol of the extraordinary resilience of this city and its people, of the entire Gulf Coast and of the United States of America. You are an example of what's possible when, in the face of tragedy and hardship, good people come together to lend a hand." The White House has sought to play up its role in helping in Katrina recovery not only in Louisiana, but also Mississippi, Alabama and Florida, touting the billions spent since Obama took office in 2009. As The New York Times writes: "New Orleans's economy is thriving, a new $1.1 billion hospital has opened with another being constructed, the school system has been overhauled, and the city is now protected against a 100-year storm with a $14.5 billion levee system that is far better than its predecessor." "Proportionately, the number of whites has risen while the number of black residents has gone down. There are 100,000 fewer black residents in New Orleans than before Katrina. African-Americans now account for less than 60 percent of the population. That's down from two-thirds. "And that has changed the culture of the city. 'You can't even hear the same dialect that you used to hear,' says Stan Norwood, a barber and leader of a community group in the Freret neighborhood. After spending so much time in Houston after evacuating during Katrina, Norwood says he's even lost some of the city's distinctive drawl. 'The drag? The New Orleans drag? It's hard to find,' he says."